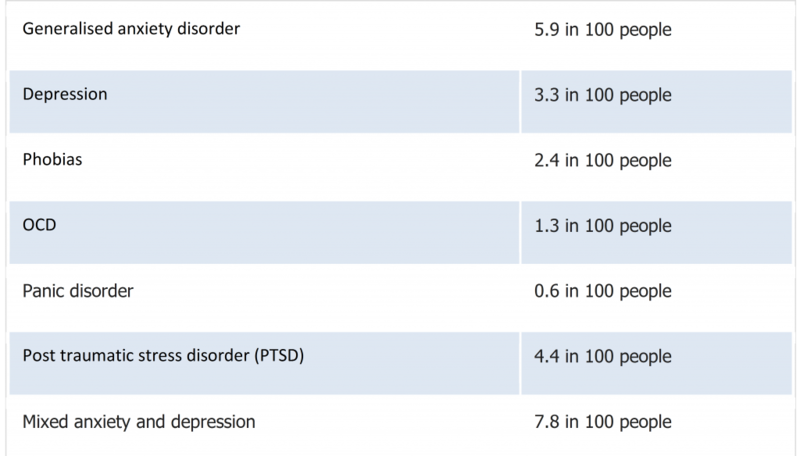 Mental health means different things to different people and like physical health it is ever present and can fluctuate depending on internal and external factors. A conscious decision was made to establish the Crossrail mental health programme as part of the over-arching occupational health and wellbeing strategy. This report demonstrates Crossrail’s approach to mental health in order to reduce the stigma associated with mental health and provide a programme that was both diverse and structured. Creating a culture that normalised the promotion of good mental health at work, in an intrinsically macho industry, needed careful consideration and timing. Mental health was not easily understood and this created a hesitancy that was managed through the use of mental health data, moral courage, the media and early positive feedback. 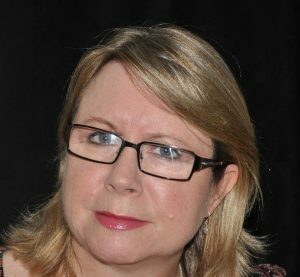 The mental health programme aimed at going beyond general awareness of mental ill health and stress at work to providing the skills required by line managers and employers to cope with the pressures of modern day life and thinking. This paper will be of benefit to all major projects looking to implement a mental health programme or improve mental health service provision. Organisations want a workforce that is fit to do the work they are employed to do and are aware that individual health status fluctuates over time, requiring understanding and support to minimise the negative effects and maximise the positive effects. Crossrail incorporated its mental health programme into its overarching occupational health and wellbeing strategy, partly to normalise the promotion of good mental health and in recognition that you cannot have good physical health without good mental health. There is good evidence that work is good for people’s mental and physical health and wellbeing and that common mental health conditions are common within the general population and the working population. With mental health conditions (stress, depression and anxiety) accounting for 37% of all new and long-standing cases of work related ill health. Statistics published by the Office for National Statistics in 2017 showed that men aged between 20 and 65 working in the construction industry between 2011 and 2015 had the highest rate of suicide in England, compared to other occupation groups. A business case was presented to senior management that was aimed at raising understanding about the prevalence of mental ill health at work, its impact on performance and the potential effectiveness of a range of interventions. Defining mental health was important to demonstrate the wide spectrum of conditions from everyday pressures, worry and grief, to common mental health conditions such as anxiety and depression and even psychosis. Too often mental health is automatically associated with psychosis or stigma related to weakness or fear, when it is usually the ups and downs of life and common mental health conditions that are most prevalent and which can be managed more readily. Definition: Mental health is a state of well being in which the individual realises his or her own abilities, can cope with the normal stresses of life, can work productively and fruitfully and is able to make a contribution to his or her own community. Research by the Centre for Mental Health in 2009, estimated that the cost of mental health problems to business was over £1,000 per employee per year. This took into account lost working days through sickness absence, reduced productivity by employees underperforming at work (also known as ‘presenteeism’), and the cost of replacing staff who leave their jobs due to mental ill-health. Mental health is personal to every individual, so the mental health programme needed to provide a blended approach that included; general awareness of mental health conditions, resilience and how to support self and colleagues. 4.0 What did Crossrail Do? A review of the literature, good practice and resources was conducted and the ACAS and Mindful Employers training pack was identified and used as the basis for the Crossrail mental health and wellbeing programme. The timing of the review coincided with; an increase in media coverage on mental health issues, the launch of the Construction Industry Leadership Group workstream on mental health , the Public Health Responsibility Deal and the London Healthy Workplace Charter, which each included a section on mental health. Further research was also being conducted by a number of mental health charities. All of which provided the visibility needed to support the implementation of the mental health programme and added weight to the business case. Primary interventions focus on preventing poor mental health and wellbeing, through effective leadership practice. This required executive commitment to key elements. These were identified as: a mental health and wellbeing survey (required to understand the mental health needs for the organisation); the performance review process needed to demonstrate return on investment; specialist advice and support needed to be integrated in the Crossrail management system. The contractual requirements of the Principal Contractors also needed to reflect what was required. Secondary interventions focus on reducing the impact of poor mental health and wellbeing, through screening, training/education and encouraging early personal strategies. Focus was placed on awareness training for line managers to support the workforce; specific training for high risk groups; life-skills training for individuals, and a range of workshops and presentations on general health promotion. Tertiary interventions focus on treating mental health ill health conditions, through psychological/mental health support services. To comply with this an employee assistance programme was provided. A referral system for occupational health to manage performance and absence, and signposting to specialist mental health services were all put in place. Mental Health First Aider (MHFA) training was provided by Crossrail so that each of the sites had at least one person to call upon who had a good awareness of mental health issues. The Principal Contractors were also encouraged to offer training to their staff. A job description was developed and volunteers came forward to join the MHFA network. Following initial training, the MHFA network members were invited to regular meetings for on-going training and support, sharing of experiences and peer support. The Crossrail occupational health specialist provided one to one support for the MHFAs post intervention, and a signposting guide was developed. 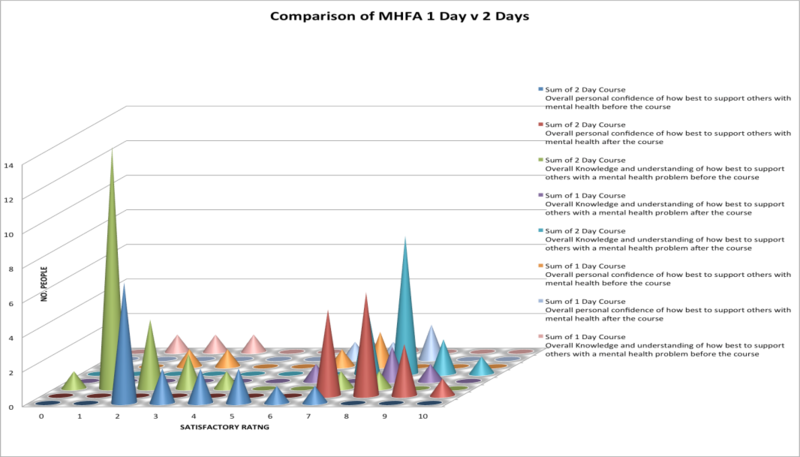 The MHFA network was used to provide individual and team support and awareness. Storytelling and case studies were encouraged as part of the mental health communication plan. Readily available materials from mental health charities and personal stories from people working on the Crossrail project were used in the regular toolbox talks given on all sites and featured in in-house publications. Senior managers also shared their experience of mental health through Blogs sent to all staff and mental health was one of the key topics used in the Crossrail Health and Safety Impact video series. Crossrail instigated an annual wellbeing programme called Stepping Up Week. Mental health awareness seminars, such as; mental health conditions, stress, fatigue, nutrition, digital detox, exercise and mindfulness, were incorporated into this. Resilience training was provided for the workforce, focussing on resilient thinking, motivation and engagement and building a personal resilience toolbox i.e. managing personal energy and the impact of technology. Personal development workshops were available as part of core staff training, including; relationship management, leading teams and time management. Line manager training on mental health awareness was developed and provision of a line manager’s resource pack was undertaken. The sickness absence-training programme was enhanced to incorporate a case study relating to managing mental health. In order to understand the mental health needs on the Crossrail project a staff wellbeing survey was procured, which was validated and allowed for comparison; was quick and easy to use; could be translated into the main languages used on the Crossrail Programme; could be mapped against the HSE Stress Standards  ; measured the impact of any interventions and was supported by an organisational psychologist to help with analysis and recommendation for interventions. In addition, a number of focus groups were set up. The primary focus group was comprised of the health and safety advisers, wellbeing champions and mental health first aiders. The focus groups were held after the results of the wellbeing survey were made available, in order to understand more about what the results revealed and to allow people to suggest solutions for issues highlighted. As part of the overall health and safety programme on Crossrail Stepping Up Week is a health and safety engagement initiative held twice per year across all contracts and sites. These events were used to launch the mental health and wellbeing programme. 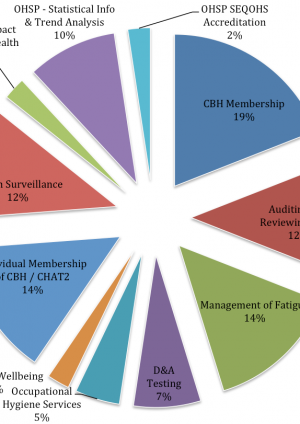 This provided the opportunity to pilot a number of bite-sized initiatives to test out and determine the content of the full Crossrail mental health and wellbeing programme. The Stepping Up Week Mental Health learning legacy paper details the types of events and initiatives that were implemented. Each site was provided with a range of promotional materials, including; toolbox talks, promotional messages, leaflets, posters and a list of further resources. The Crossrail in-house publications would contain feature articles from across the project. The initial awareness-raising workshops were soon superseded by resilience and mindfulness workshops incorporated into the full training schedule, with a considerable pull from the workforce for more workshops. Review, trending and reporting of occupational health indicators – such as sickness absence data, health surveillance and management referral data. The resilience workshops and mental health first aiders courses were key elements fro increasing staff health and wellbeing focusing on mental health specifically. 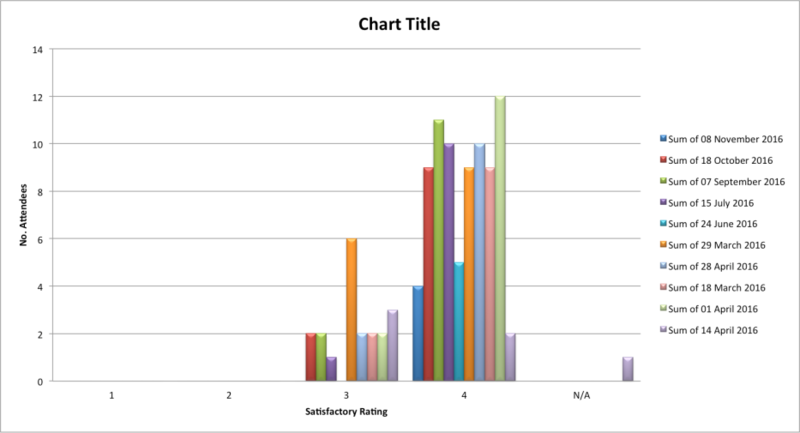 The following graphs (in figures 1 and 2) give an indication the results of the satisfaction surveys carried out from the 2 types of resilience workshops held. The course satisfaction was rated on a scale of 1-4 and the results indicate that the courses were very well received. There were two different Mental Health First Aid courses run. One was a one day course and the other a two day course. Each was delivered by different providers but, from the feedback obtained, both demonstrated a good transfer of knowledge and delivery of the course. The figures below give an indication of the knowledge levels before and after the courses. 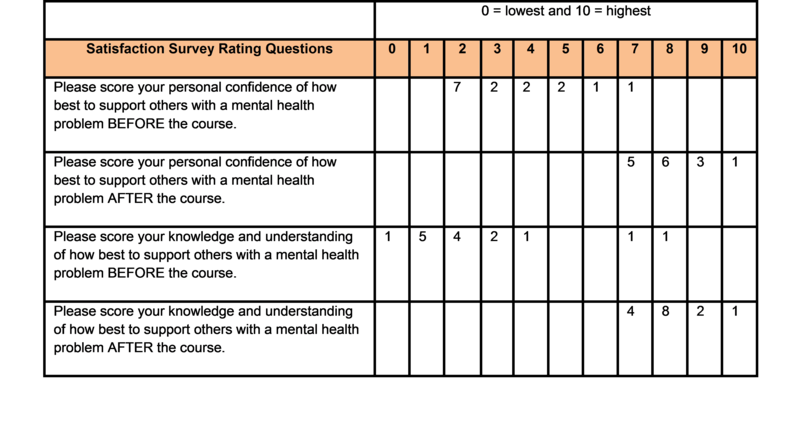 Assessing the result of the surveys above the outcomes were quantified by the analysis as shown below. The 2 day course providers quantified the results by percentage. From the responses received personal confidence in dealing with mental health problems increased by 66% and knowledge and understanding of how to support others with mental health problems increased by 88%. This indicates that the training provided good support and increased the knowledge base of the attendees significantly. The mental health programme continues to develop with the mental health first aiders taking a more active role in promoting good mental health. The resilience workshops are being offered on more sites and the skills are being embedded with follow up workshops. Mental health awareness is part of the annual wellbeing programme and more people are feeling confident about sharing their personal stories. It is important to take the opportunities created through the greater visibility by campaigns in the media and in the construction industry. It is vital to tackle any misconceptions about mental health being personal and not something that should be addressed at work. Professional resources should be made available for managers and staff to help them make informed choices about their heath, and to feel confident to talk about mental health. 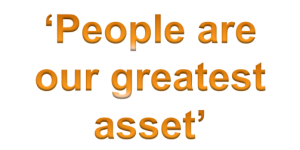 Provide the evidence base for senior management. Evaluation of the effectiveness of the courses both quantitative and qualitative is essential. Normalise mental health by including it in the occupational health and wellbeing strategy and annual improvement plan. Use both qualitative and quantitative measures to demonstrate effective outcomes. Conduct research into the effectiveness of interventions by external sources and to identify the best way of incorporating a mental health programme that suits the organisation. Changing the culture of mental health in the workplace can take a long time, depending on how ingrained the present culture is and how committed the leadership team is to embrace a long-term goal. A range of measurements that are both qualitative and quantitative are required to demonstrate return on investment and the correlation between good mental health and performance. The benefits and improvements in the workforce health and wellbeing that are achieved will ultimately demonstrate the effectiveness of having this type of programme in place as it will also be demonstrated in the productivity and effectiveness of the organisation. Office for National Statistics. (2016) Suicide by occupation, England: 2011 to 2015 article. Seymour L. Common mental health problems at work: What we now know about successful interventions. A progress review. London: Sainsburys Centre for Mental Health; 2010.